Educators around the world seek to guide students toward becoming successful learners who are driven to learn and are eager to figure things out. Educators want to create environments that support these learners to use the materials and tools around them to find solutions and establish new ideas. They want learners to value and connect with others. The UDL framework guides educators toward designing this type of environment. CAST, the creators of UDL (and publisher of one of Loui’s books), saw that all students needed access to learning but knew access was more than a ramp into the building. Now we know that access includes the opportunity to establish an emotional connection to learning. Access includes the ability to identify and use the best tools for learning in that moment. Access includes the ability to communicate what you know in a variety of ways. This basic level of access opens the doors to all sorts of learners who come with individual needs, strengths, hopes, and desires. This is why Loui is passionate about helping others implement the UDL framework. She also recognizes that while the framework is broad and built on research from neuropsychology, education, and special education, it should be purposefully examined via the context of local, culturally-driven educational norms. It’s one thing to learn what UDL means, it is another to confidently bring it into a setting and identify how it can align with and improve upon current practice. Loui has worked with educators from across the United States of America, Australia, Austria, Belgium, Canada, Czech Republic, Italy, Japan, Singapore, and Slovenia. 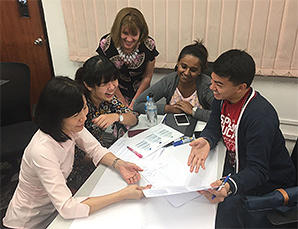 In each case, she took time to immerse herself in their culture, sought to understand their educational systems and historical context, and worked alongside these educators helping them understand the straightforward and the nuanced parts of the UDL framework. She looks forward to exploring UDL with you and your educators in your local educational context.